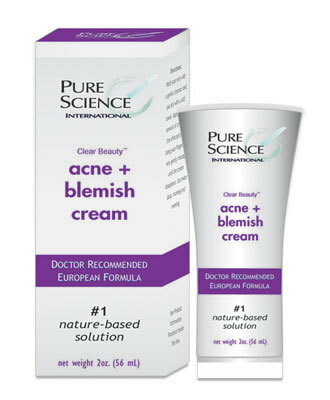 Clear Beauty™ Acne & Blemish Cream is an effective aid against many forms of acne & skin blemishes. Helps make skin look fresher, clearer & more radiant. Contains Omega 3 & 6 blended with other natural ingredients to help you achieve a better complexion. Description: This doctor recommended exclusive, natural-based formula has been purposely formulated to help relieve the problems associated with Acne Vulgaris. The key treatment compound is AC.Net™ - a new anti-acne complex from Sederma, France. Based on Caprylyl Alcohol, Nordihydroguaiaetic Acid and Oleanolic Acid, this compound has been clinically proven to be effective on many forms of acne and skin blemishes. Clear Beauty™ Acne & Blemish Cream also contains Aloe Vera Gel (40%) and Niacinamide (Vitmain B-3) at 4% - both ingredients showing excellent effectiveness on acne prone skin. To further enhance the performance of this one-of-a-kind formula, Keratoline™ ( Sederma, France) has been included for its gentle, enzyme-based skin exfoliating action. Clear Beauty™ Acne & Blemish Cream hydrates the skin; leaving the skin fully moisturized and soft to the touch. Feel the difference in one day and see the difference in two weeks.